The compact camera market has suffered huge losses over the last 5 years, most likely due to the rise of the smartphone as an ordinary person's first choice for snapshots. Only time will tell whether the smartphone market will gobble up most of the market, or whether this is merely a temporary slump and innovation will rejuvenate the beleaguered segment. Regardless, manufacturers continue to churn out compact cameras, and the good thing about a slump is that they're forced to innovate and experiment. Sony, Fuji and Olympus have released some noteworthy cameras in the last couple of years, but the dp series of cameras by Sigma seems to suggest that they went back to the drawing board for designing compacts entirely. I'd looked up a review of the dp1 Quattro right after I got the call asking if I'd be interested in reviewing it. While the photos did kind of prepare me for the unusual design, it was only when I actually held it that I fully appreciated the bold new design. It isn't without its flaws, but it makes up for them in my opinion. The Sigma dp1 Quattro: a little awkward to hold with one hand, but I love the low-key design. While the weight of the camera will rest (somewhat uncomfortably) on your ring and/or little finger, both the command dials are easy to turn with the forefinger and thumb, allowing for quick and easy changes to shooting controls. Sigma's strategy with the dp Quattro series strikes me as a little odd: four fixed-lens compact cameras? In mid-2014, they announced the dp0, dp1 (which I'm reviewing here), the dp2, and the dp3. What makes it perplexing is that other than the focal lengths that range from an ultra wide-angle (dp0: 14 mm / full-frame equivalent: 21 mm ) to a telephoto (dp3: 50 mm / full-frame equivalent: 75 mm), there are no discernible differences between these cameras. I'm no market researcher, but this seems like quite a bold move. I wouldn't have thought that the market even exists for each of these products, and suspect that this is a "lets test the market with these products" exercise by Sigma. I'd imagine that this approach has some potential, but I would have much preferred to see it as an ILC or EVIL or mirrorless. Or whatever term the industry is using for an interchangeable compact camera these days. Anyway, kudos to Sigma for innovation in a market that -thanks to the smartphone- has seen much turmoil, and for daring to dive into waters without hesitantly testing the temperature beforehand. Note: This review is being published a little later than I'd originally intended (more on that in a bit), because Sigma now has exactly that: a camera line called the 'sd quattro'. Announced on Feb 23, 2016, I'll be looking forward to seeing reviews from other bloggers. Incandescent, Fluorescent, Flash, Color temperature, Custom. There's no built-in flash, although the hot shoe provides the option of adding one. Flashes on compact cameras can add to design-complexity, price, and create ugly, harsh shadows, but they occasionally come in handy as fill-lights. Shooting indoors at night would be a huge problem. For a fixed-lens compact, 19mm (28 mm full-frame) is a good focal length / field of view. The lens is distortion-free, but the wide-angle means that you'll only want to purchase this if you're going to be using it as a travel or street camera: it wouldn't be my first choice to shoot portraits, since you'd have to be right up in somebody's face, but it will certainly fare better than your phone. APS-C sensor! Yay! While this indubitably increases the price of a camera, I love the fact that manufacturers are pushing for this to be the de facto standard for enthusiasts or serious shooters. Here's where I have to tip my hat to Sigma. The design of the dp line of cameras immediately makes an impression on you. Whether you like it or hate it, it's going to turn heads. Photographer's heads, that is. I found it to be surprisingly inconspicuous while using it in the field. A DSLR always garners attention in the street. Even with the comparatively large (for a compact) lens, the dp1 didn't seem to. If I only had words to describe it (thankfully, I'm a photographer so photos will soon follow), I'd have to say that it looks like a smartphone with a handgrip that was welded on to a prime lens. It's unique and striking. When I first held it, I spent a few minutes just looking at it. It's quite a departure from the typically clunky compact cameras that the market is flooded with. Sigma's dp line unmistakably stands out among the competition. They've definitely gone to work on rethinking what a compact camera should look like. 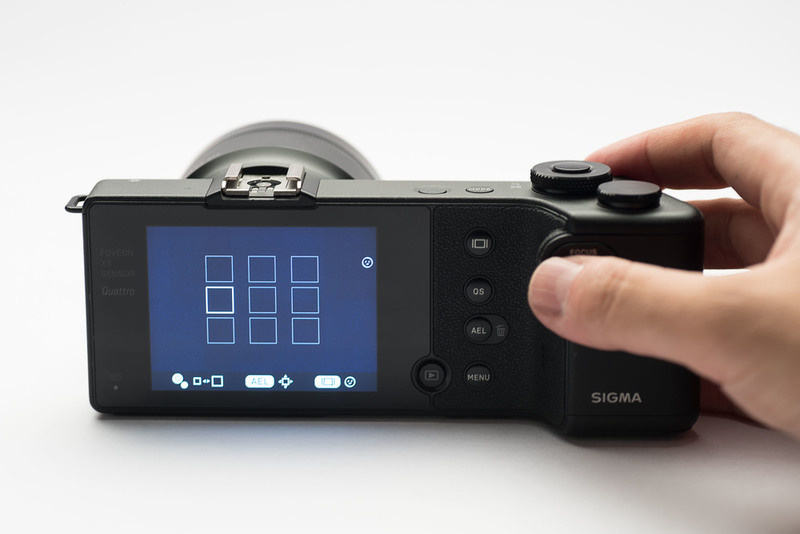 It's good to know that Sigma is spending time on the drawing board while other manufacturers merely continue iterating newer versions of the same product. The front sports the 19 mm/f2.8 lens. The LED-like thing on the front of the lens barrel is the AF illuminator. The back features various menu buttons and a D-pad, along with a fixed 3", 920,000 dot TFT LCD. Gotta love the minimalism: the top of the camera has a standard flash hot shoe, a power button, a shooting mode button and two command dials. The bottom, of course, is where you'd expect to see the battery compartment and a standard tripod mount, which is perfectly in-line with the lens' optical centre. Overall, the design -although refreshing to see- is a bit of a mixed bag. The camera isn't something that will fit in your pocket, unless you're a Hulk-sized individual. While the camera body is slim and sleek, the protruding lens adds considerable heft and volume, making the entire camera both compact and not compact at the same time. Its size and design are reminiscent of a mirrorless camera. 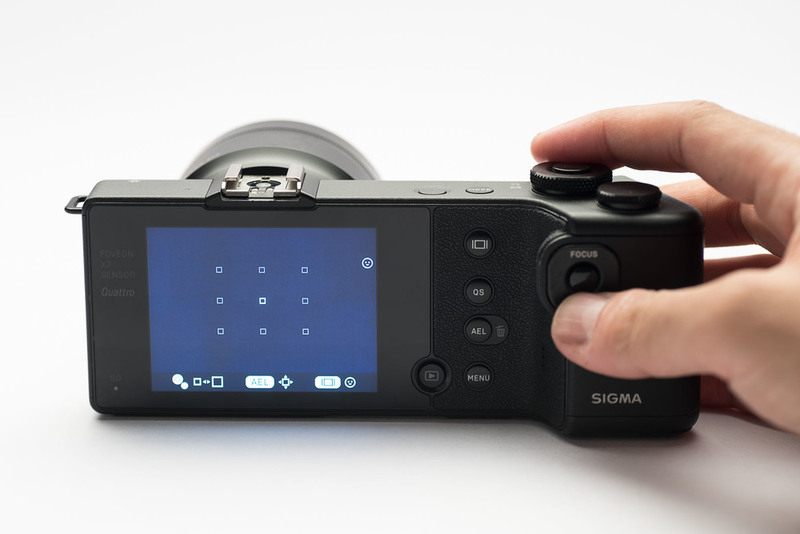 Sigma's taken a no-nonsense approach to the dp1's button layout: it isn't riddled with unnecessary items that leave you scratching your head or gnashing your teeth in frustration. Unlike some other compacts I've used in the past, I didn't find any need to go sub-menu-hunting for features like exposure compensation (wonderfully implemented, just hit the rear command dial), auto exposure lock (aka AEL), or quickly changing ISO or white balance. About 3.5 seconds after you hit the power button, the camera's ready to shoot, displaying info about the battery level, ISO, white balance, image quality, aspect ratio, file format and frames remaining on the top, with exposure info at the bottom. The 3" LCD is replete with information. One huge plus point is that you can swiftly dial in compensation with the real command dial. I found this to be very useful while shooting. 1. Display button (topmost, camera-back): controls readout on the LCD. Clicking once gets you an electronic horizon level that turns green when perfectly upright. I didn't really use it, but it's a nice substitute for a bubble level. Hitting the display button (topmost on the back of the camera) overlays a horizon level and a histogram. Hitting the display button once more will darken the LCD entirely, effectively turning it off. I have no idea why anybody would need this (the camera remains on and active). 2. 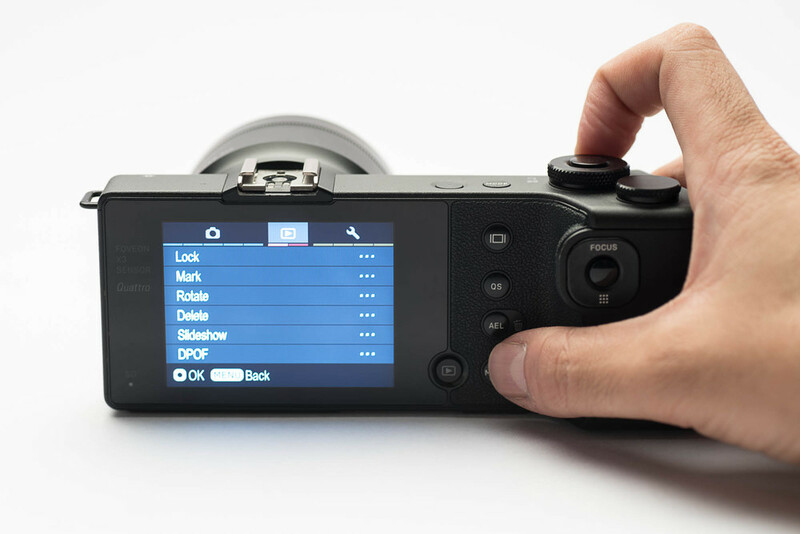 QS (Quick Set) button: The quick set button delivers a screen that allows you to quickly change numerous settings: ISO, metering, drive mode, white balance, image file format, image quality, aspect ratio, and JPEG post-processing settings (standard, vivid, monochrome etc. - I rarely delve into these on any camera). For the most part, this is quick and easy. I would have preferred a dedicated button for white balance, but compact cameras have limited real estate, so that's understandable. 3. AEL buttton: no surprises here, it locks your exposure after metering. A second press will unlock. It also doubles as the button you hit for deleting files when reviewing photos. I'm not going to upload a photo for this screen, since it serves little purpose. 4. Menu button: Where you can access and change a plethora of features. Some of these can be accessed via the QS screen, but if you'd like to change whether ISO increments are 1/3rd of a stop or 1 stop, for instance, then you'll need to access the menu. It's a comprehensive list, as one would probably expect with an enthusiast's compact. A slideshow with all the screens follows, just in case you're interested. 5. The review button: does what you'd expect it to do. Enough said. 6. The D-Pad: is where Sigma have placed focus-related controls, when it's not being used to manipulate menu-choices along with the command dials. The left and right buttons do nothing unless you hit the top or bottom first. As already noted, this is a bit of a bummer. The top button will change focus to manual. Without focus peaking though, manually adjusting focus on an LCD is next to impossible to get right. I would hope that a firmware change would make this possible in the future, but I don't know whether that's even possible. The top button on the D Pad switches to manual focus. Sigma has provided a distance scale to help, but I found it to be of little use as a substitute for focus peaking. The down button on the D Pad brings up the AF point selection screen. The buttons on the D Pad correspond to the 9 AF points that are available, as you would expect. Turning the front command dial while holding the bottom button changes the size of the AF point. There are 3 AF point sizes to choose from, but you probably won't find too many situations where you'd have to change the size at all. I found no need to change the AF point to its smallest size setting. Since the design is so unusual, I expected the Sigma dp1 Quattro to attract some attention while I was out using it. Surprisingly, it didn't. I didn't get as much as a second look. 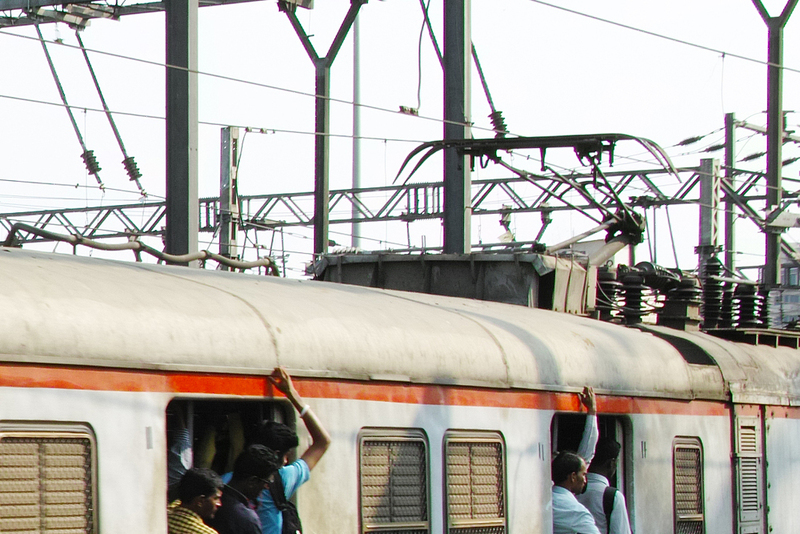 A few people on a Mumbai local were fleetingly curious when I raised the camera above my head, but that was it. A DSLR, in comparison, always garners interest. Often, not the right kind, either. Anyway, the camera is fairly quick to focus, and I found no situation where it had to 'hunt' to confirm focus, either. However, depending on the file format you've set it to, it might take a while for the camera to write to your card. To some extent, this depends on the SD card you're using, but even with a 90 MB/s Sandisk Extreme Plus (UHS-1), I found the camera to be really slow when writing RAW files. Considering that the files can be 40-50 MB, I guess I shouldn't be surprised. Even JPEGs are a hefty 16-19 MB at their highest quality setting. Controls are easily manipulated; I didn't once struggle to look for changing white balance, ISO, image quality, or selecting an autofocus point. Sigma's gotten the control placement right with the dp1: even compensation is a breeze. The lens fares well, although there is visible chromatic aberration if you look for it. It's not exactly a deal breaker, but it's there. I found the colours that the dp1 reproduced to be quite accurate, and the Auto White Balance did a pretty good job most of the time. The only real issue, I found, was noise. It isn't the pleasing kind of 'film-grainy' noise, and it's visible in both situations where you don't want it: low-light situations (or dark areas in a high-contrast photograph), and when you pump up the ISO. 1/15, f6.3, ISO 800. Standard, High quality JPEG. At ISO 800 and above, noise becomes an issue with the dp1 quattro. Compared to modern DSLRs, this is noisier than I would have expected for an APS-C sized chip. Also, while we're on the subject of RAW files, the reason this review is later than I'd planned is because i seem to have no way of importing them. Or for that matter, even viewing them on a computer. After spending some time shooting RAW files almost exclusively, I discovered that Adobe doesn't support the camera. The .X3F file format is supposedly supported by Adobe, but despite having the latest version of Photoshop / Lightroom / Bridge CC, I couldn't import any RAW files. I got in touch with Adobe tech support after I discovered this problem, and they confirmed that CC doesn't support the dp1 Quattro. To make matters worse, I downloaded Sigma's Photo Pro software (which, I'm sorry, but is just plain awful: it's almost like they hired someone off elance.com on a shoestring budget) for Mac OS X, and it wouldn't read RAW files from the camera either! I rarely shoot JPEG, so this was a bummer. Upon some investigation online, I've found out that this is because Sigma has made this a proprietary file format, effectively shooting themselves in the foot. If this were a camera that I'd purchased, I would be really upset. The inability to open a RAW file in Photoshop means that I wouldn't buy the camera. I rarely shoot JPEGs, and would hate to have to use JPEGs all the time. Thankfully since the camera's been with me for a while, I went out and took a few more photos. I was looking forward to seeing RAW photos from Foveon's much-touted triple-layer sensor, but the JPEGs honestly don't tell me much, other than that you couldn't tell the difference between a Foveon and a modern Sony or a Canon CMOS sensor. If anything, the other sensors seem to have a better high ISO performance, with significantly lower noise. 1/1000, f5.6, ISO 100. Standard, High quality JPEG. At base ISO, as one would expect, there's little to no noise and everything's tack sharp. 1/125, f8, ISO 100, Standard, High quality JPEG. The 19mm/2.8 fares well, but even at f8, you should expect to see some chromatic aberration: green and purple fringing is visible on either side of those poles. It's not too bad, though. Even though it's a wide-angle, the lens resolve fine details quite well. 1/250, f5.6, ISO 100, +0.7 compensation. 1/30, f5.6, ISO 800. Here's another example of high noise at ISO 800+. There are a few cameras out there whose noise can be pleasing to look at, resembling film grain of yore. The dp1 isn't one of them. A 100% crop of the previous image, demonstrating poor noise performance at high ISOs, or in low light. The command dials and buttons are well placed, and the camera handles really well even though it doesn't have the most comfortable grip. Image quality is good for a compact camera, but high ISO or low light also results in higher noise than I would expect in 2016. Or for that matter, even in 2014, when the camera was launched. 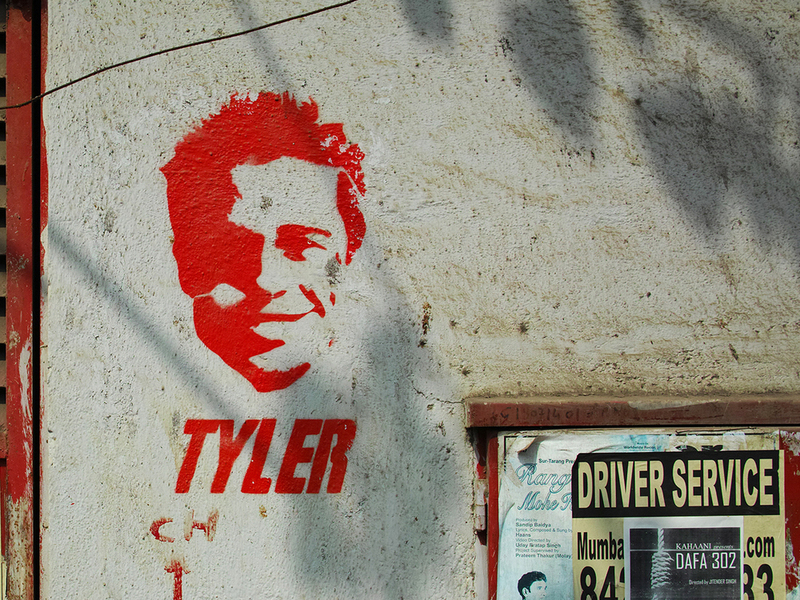 Nevertheless, I wouldn't hesitate to carry it with me on, say, a road trip. The lack of an easy way to import RAW into Photoshop means that I just wouldn't ever buy the camera myself. Discreet camera for street / travel photography, despite the large-ish lens.